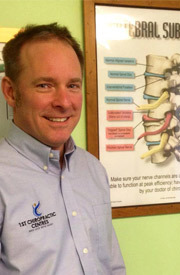 Hi, my name is Robert Gruhn, myself and my wife Pam opened 1st Chiropractic Centres in March 2001 after graduating from Life University, College of Chiropractic, in Atlanta, Georgia, USA, and haven’t looked back since. We have been proudly serving the Yateley community ever since. We don’t think you’ll find a friendlier chiropractic clinic around! Everyone that comes to our clinic is warmly welcomed into our chiropractic family and made to feel like they belong. We are very passionate about your health and will do our utmost to get you feeling happy and healthy again. All patients at 1st Chiropractic Centres will receive an individualised care plan, aimed at eliminating your symptoms, finding the cause, correcting that and providing you with a rehabilitation schedule so that you can have a better chance of stabilising your spine, decreasing the likelihood of a relapse. If after our thorough review of your symptoms we feel another health professional is more suitable to help you, we will point you in the right direction of who we think that will be. If you have any concerns about your health, give our Yateley clinic a call or stop in, we are always here to help. Helping Yateley live without Pain! Excellent professional and friendly service. Have recommended to friends. I would happily recommend your services to everyone in need of help, a truly painless experience. Thank you ! Rob and Pam make you feel welcome and relaxes. A friendly and warm atmosphere. Have always had good results and will continue to use in future. Excellent friendly service. Would recommend to all. I feel very comfortable visiting this Chiropractic Centre, confident they can help and enjoy the company of the staff. Many thanks, my son seems to be so much better. I couldn’t be happier with the advice, treatment and follow-on care that I have received. In addition, all of the office staff are really friendly and helpful. I highly recommend this practice. Every visit, I felt valued as a customer. Very thorough, friendly and professional practice. Will share my experience with others and highly recommend you! The service that I received at this clinic was excellent and I can highly recommend it.